Today’s guest is Kelsea, the blogger behind Teacher Gems. 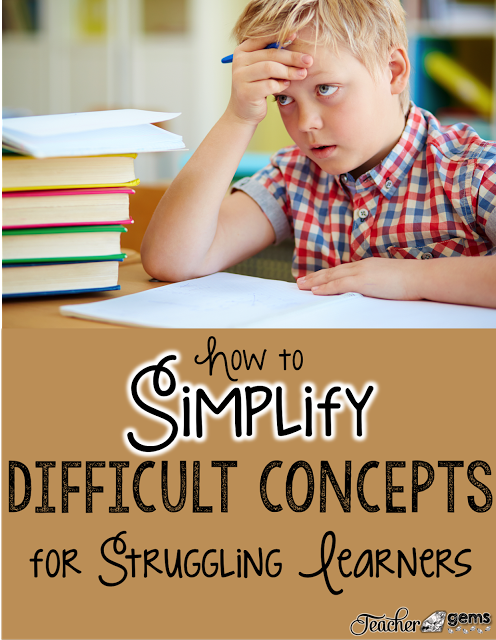 We all know how important it is make sure all of our students master the concepts we teach, so Kelsea’s post today shares her tips on how to simplify difficult concepts for struggling learners. My 4-year-old daughter went through a phase a few years ago where she had to clarify everything she said. “Mommy, that car was blue. It wasn’t green. It was blue.” “Mommy, this is a circle. It’s not a square. It’s a circle.” Like any mother, I thought it was cute at first, but after a while, it proved to be a challenge. “Mommy, I saw a duck, not a bird, a duck.” Try explaining to your 2-year-old that a duck is, in fact, a bird, and you quickly realize there is no reasoning with a 2-year-old! However, she was onto something! When students struggle with difficult concepts, start by using examples and counter-examples. For instance, when teaching that a number is divisible by 2 if it ends in an even number (0, 2, 4, 6 or 8), you should give them lots of examples (2, 48, 356) and counter-examples (9, 83, 761). If students are stuck on a particular concept or rule, then be sure they understand the relevant vocabulary. You may need to define words or rephrase using simplified terms. For example, if you are teaching a short vowel spelling rule, and your students get stuck on the word “consonant,” be sure to first define the word for them. If they continue to have a hard time, then consider using a different word (i.e. “letters”). Students often struggle with math concepts when they do not understand vocabulary in word problems. 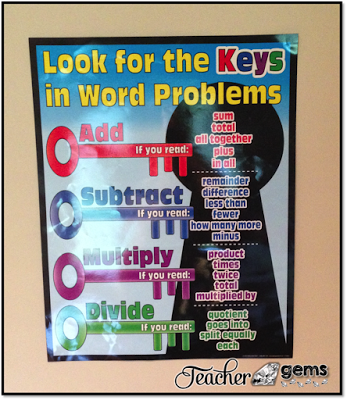 In my resource room, I kept this key words poster on the wall as a reference for students as they worked through word problems. Visuals can help turn a concept from abstract to concrete. Use models to help students visualize concepts such as the water cycle. 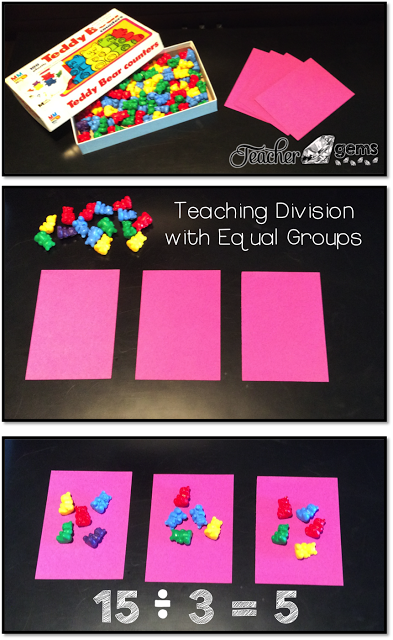 Use manipulatives to teach math. For example, in teaching division, you could try to verbally explain to your students how 5 can be divided into 15 equally 3 times, or you could show it using objects as the picture illustrates below. Some spelling rules can also be difficult for students to remember. In an effort to help students visualize the rules, I created a set of short vowel spelling rule posters, where I tried to simplify, define, and illustrate each rule. 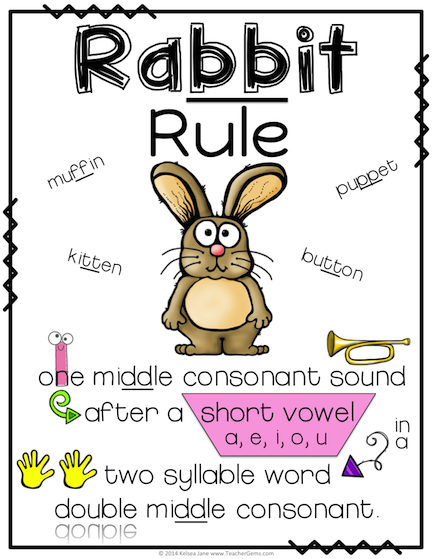 On my Rabbit Rule poster, I used images such as two hands to represent two syllables. Since students often clap the syllables, the image of the hands should trigger their memory of the definition of a syllable. Another strategy is to have students draw what they think when they hear about a particular concept. This will give you further insight into their level of understanding and prior knowledge, which you can then build upon. Connecting new information to prior knowledge will also help with long-term memory storage and retrieval. For more on this, read my popular blog post called 10 Tips for Teaching Memorization. Use task analysis – teach a concept in small chunks until students have gained mastery. When teaching a new rule, be sure your students have a solid understanding of the rule before you teach them the exceptions to the rule. Try to first teach the concept in isolation, and then re-introduce it in context. For example, sequencing is a skill that can be difficult for students to master. 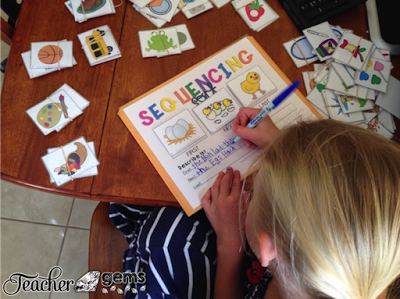 In my sequencing sort skill center, students learn to sequence outside of reading by ordering a set of picture cards and then describing the order they chose. For more on this topic, read my blog post called 3 Ways to Help Students Master Sequencing. Knowing your students’ learning styles and multiple intelligences will help meet the needs of individual learners. If you know the student learns best through music, then put the new rule or concept to a familiar tune to help with recall. If your student is a kinesthetic learner (which I have found a tendency in struggling students), then use math manipulatives and demonstrate the rule. This will also help your visual learners! There are several quick assessments you can use to learn about your students, including assessments for learning styles and others for multiple intelligences. 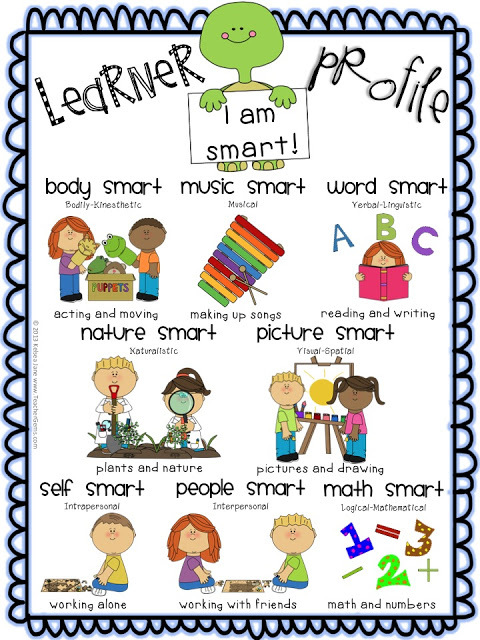 If you have young learners, then you can use something like my learner profiles (pictured below) to help determine your students’ learning styles and multiple intelligences. Students will need lots of opportunities to practice the new skill or concept they have learned. One great way for students to review a new concept is to have them teach it to someone else. Teaching a concept reinforces the learning process, prompting differentiated and more in-depth comprehension. The process of communicating the new skill or concept also develops learning, as the student must be able to explain using practical application. Finally, the opportunity to answer questions will enhance comprehension specific to the new concept or skill, as well as promoting communication and adaptive thinking skills. I hope these tips help your struggling learners find success in the classroom! Thanks for reading, and blessings on a new school year! Kelsea lives in Michigan with her husband and three young children (soon to be four)! She has an bachelor’s degree in Special Education: Cognitive Impairments and a master’s degree in Special Education: Learning Disabilities. She taught PreK-8th grade special education and general education 4th grade for six years. She is now a stay-at-home mom beginning the journey of homeschooling. 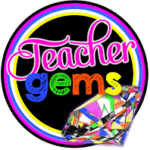 On her website, Teacher Gems, you will find loads of educational websites for teachers! For differentiated resources from special education to academically talented and a sprinkle of clip art, check out her TpT store!